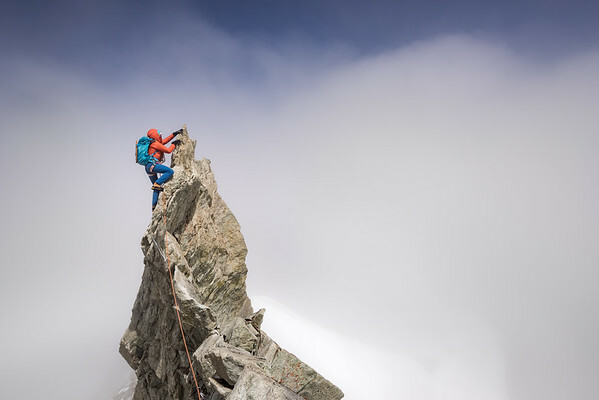 ​Curiously, having spent ten years in the Alps, ​I hadn't climbed the Dent du Géant before, but didn't have much interest in the ​crowded 'normal route'. 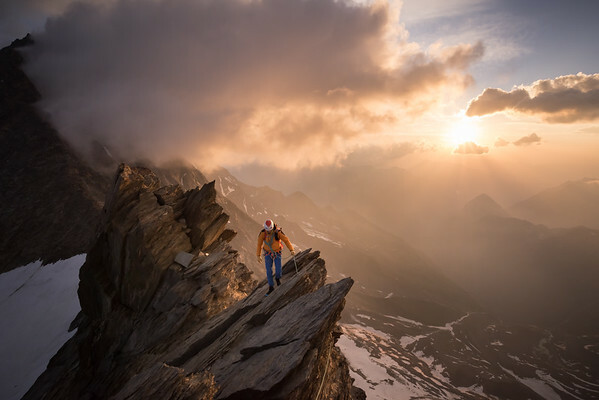 It was mid August in a very busy summer of climbing and guiding so I was looking for something quiet. 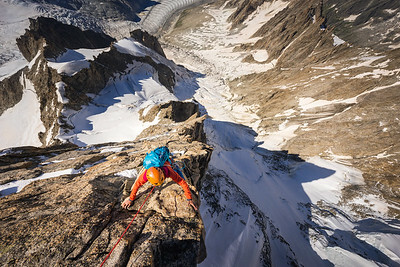 I had heard about an esoteric and rarely climbed route on the north ridge of the Dent so ​snuck round and​ climbed that​ - a wild and interesting route on excellent granite​. As usual I was carrying a chunky full frame camera, but unusually I had decided to bring obscenely heavy 14mm ultra wide angle lens as I thought it might help photographing the steep and narrow ridge, which ​thankfully ​it did. The day was ​calm ​clear, but the climb took quite a while, especially taking photos, and we arrived at the summit in the mid afternoon​ as clouds were starting to build behind us​. 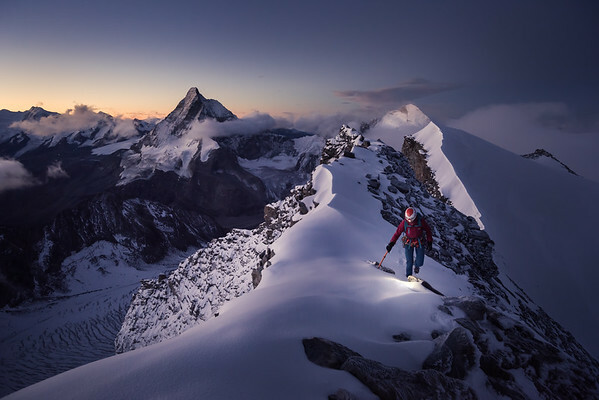 This photo is at the start of the steep abseils down the east face. 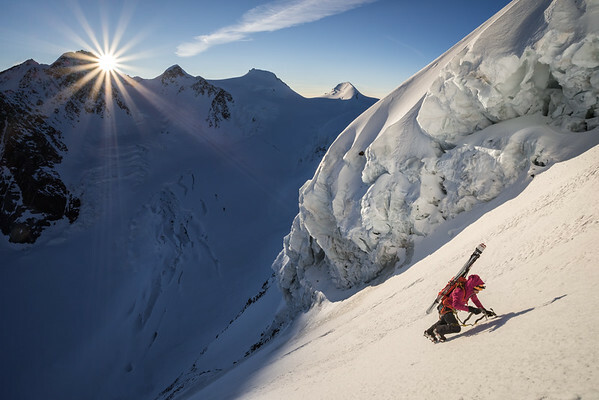 I don't normally go for 'classic' shots like throwing the abseil ropes, but I was scrambling towards Valentine when I noticed how the Mont Blanc range was laid out behind her. When I took the shot I barely registered that it might be anything more than a shot to fill in the narrative of the climb, especially as we were already in the shade. It wasn't prepared or posed in any way, and I guess that's why it remain quite fresh despite the well used 'motif'. 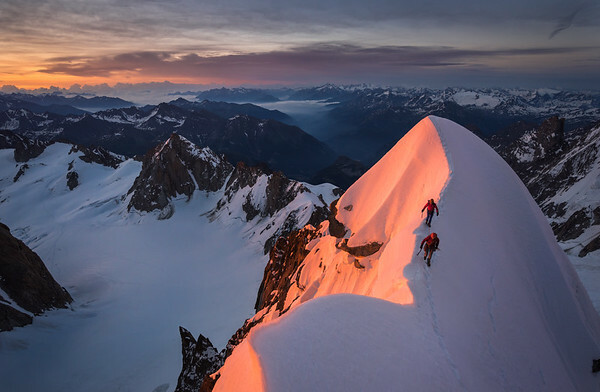 The following day Valentine and I climbed the classic "Diables Ridge" on Mont Blanc du Tacul which provided a mass more shots for the book and I came back from two days with several thousand images to process. 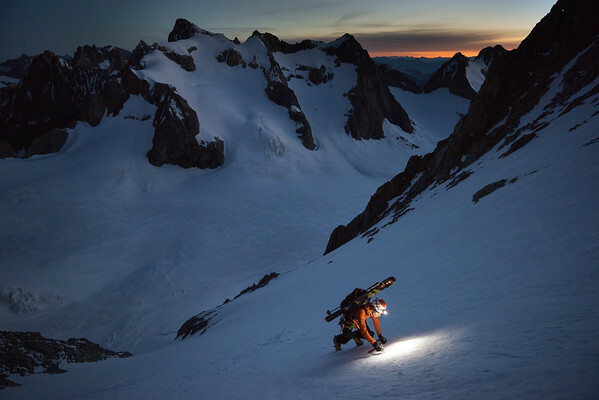 Jamie Hunt and Paul Cornforth on the Arete des Bosses, Mont Blanc, at sunrise. 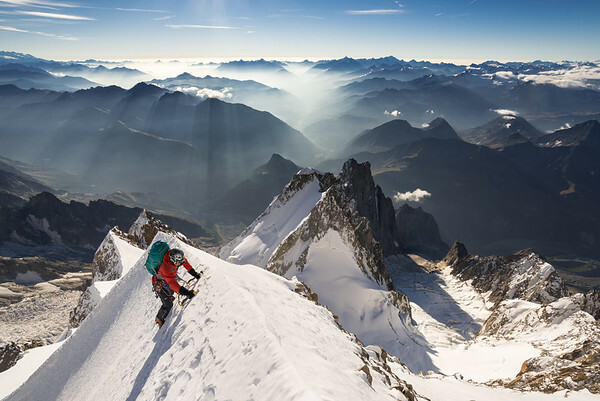 Mont Blanc's shadow is on the horizon to the left.